Whitesnake to release tour book. Dig deep! Forty years after founding the band, David Coverdale announced this week that Whitesnake are to issue a book chronicling ‘The Purple Tour’ of 2015, in which Coverdale celebrated his days as singer of Deep Purple. The band had released an album of reworked classics from the Mk III and Mk IV versions of Purple, and revived several of those songs for Whitesnake’s live set. It was a surprising move for long-term fans of that band, since Coverdale had stated consistently in many interviews that he much preferred to look forward rather than back. However, the release of a covers album did help take some of the pressure off incoming guitarist Joel Hoekstra, who had at that time just taken over from Doug Aldrich, Coverdale’s long-serving co-writer, co-producer and guitarist. All this lavishness won’t come cheap. For the standard edition, prepare to fork out the best part of a ton (it will sell for £95) and make sure you have somewhere to keep it safe and nice, printed on what they proclaim is ‘170gsm artpaper’ (so, fancy then) you’ll probably want to handle it wearing cotton gloves. That’s before we get on to the deluxe edition! This one will sell for a staggering £250; that’s right – TWO HUNDRED AND FIFTY POUNDS, and if you’re so much of a fan of the ‘Snakes to consider either of these editions, they’re presumably thinking you’ll want that edition and are prepared to dig deep indeed for it. This edition will be limited to 300 copies worldwide (the standard edition is limited to 500 copies) so it will be exclusive alright, as well as expensive. As a long-term Whitesnake fan myself, this is something I’ll be passing up. I could see a few gigs for that, or even in this age of high-priced vinyl revival have several LPs to listen to. I could even have a reasonably-specified turntable on which to play them! It is, to me a case of the band as a brand; Whitesnake as a brand has other products out such as wine, there is ‘Whitesnake Workout’ gymwear available if that is your thing as well as a lavish reissue of the 1987 album, plus the usual array of t-shirts in different designs. They clearly feel their brand is strong enough to attract interest in a book like this and, if you have the house room and pockets deep enough, why not? For me though, I’ll settle for the accompanying live album/DVD and await their next tour of the UK. There’s a limit to how much ‘stuff’ you can accumulate even as a long-time fan of a band, after all and I think I have reached mine! Besides, as someone who tries to support up-and-coming bands too, it would be difficult to justify laying out that kind of money for a product from a long-established act, however beautifully presented. It would need to be kept in a case anyway, so neither of these editions will be winging its way to my home! Those who feel that they simply must have this tome whatever the cost, can click here to go to Rufus Publications and place their pre-order. Rock in print – new mag launches, is it a good sign? This month the UK’s only national radio station devoted to rock music (Planet Rock, available on DAB and internet) announced it was to launch its own monthly magazine. On the face of it this made little sense, as there is already one long-established magazine covering this genre (Classic Rock magazine, recently saved from closure) and it is dubious at best as to whether the market can sustain two print magazines. Off the back of that, another magazine has also launched. Rock Candy magazine is an independently-produced publication (‘actually printed on actual paper’, they promise!) available only by subscription and published by the team behind the record label of the same name, which specialises in reissuing long-lost albums. The publication boasts writers who were part of the team which wrote for Kerrang! magazine during that mag’s glory days of the mid-to-late 1980s, as they put it ‘written by those who were there’. 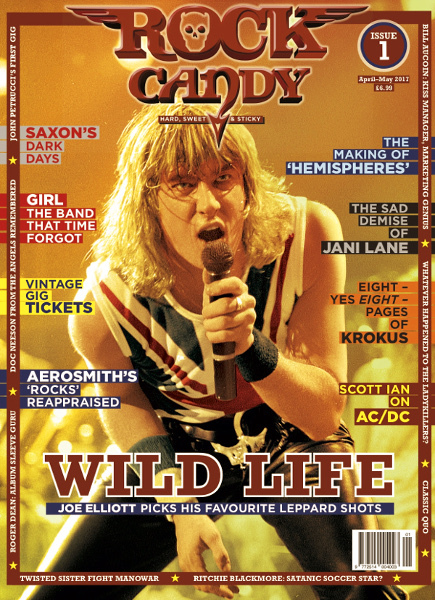 Rock Candy differs from the existing Classic Rock mag in that it has promised to dedicate itself to 1970s/1980s era rock music. Certainly with names such as Malcolm Dome, Derek Oliver, Paul Suter and Howard Johnson writing, the claim that they were there is true (all wrote for Kerrang! during the 1980s) but, unless my memory cells are fading faster than I thought, at least some of these wrote for Classic Rock too in the past. Indeed, when THAT mag launched in 1998 it set out to reach the same sort of reader, the older generation who had maybe become disaffected by the sea-change earlier in the decade that saw many good bands swept aside. However, Classic Rock has lasted this long not by rehashing the old bands over and over again (although they had a habit of giving covers to Led Zeppelin or Pink Floyd on an almost bi-monthly basis at one stage!) but by also introducing its readers to newer bands who follow in the footsteps of the great of the past. There are certainly many who have come since, I’m thinking of The Answer for example who emerged around a decade ago, and definitely draw on the template set by the classic bands, or even Monster Truck as a more recent example. They had to do this, as one editorial they ran put it, ‘otherwise the mag would become a museum’. Similarly, I cannot see a magazine devoting itself only to older bands from decades ago having a shelf life. For one thing, its audience reach is both limited and ageing – your humble correspondent is now in his fifties and has been going to gigs for over 30 years, and with the best will in the world won’t be doing it for another 30! There aren’t that many like me around, and those who are still going to gigs still like to discover new music, albeit of a style that may remind us of those good old days of denim, leather and stacks of Marshalls piled high! As regards the Planet Rock magazine, whose first issue will hit newsstands next month – it may catch on, with an established brand of its own to act as the hook and with a major publisher behind it (Bauer, owners of Planet Rock and – interestingly – publishers of Kerrang! until a day or so ago) but, will it have an impact on the existing publication? Classic Rock sells around 50000 issues a month, and only narrowly avoided closure at the end of 2016 when its parent company went bust. The title (and sister mag Metal Hammer) have been bought back by their previous publisher Future Publishing, for a fraction of what they sold the titles for. I suspect a long game is being played here by Bauer; they will throw resources at the Planet Rock magazine and if it succeeds, it will be at the expense of Classic Rock. With that title’s publisher not being as big as the Bauer organisation, it wouldn’t surprise me if the mag ended up in the hands of Bauer and ultimately be folded into the Planet Rock brand. The fact that Bauer have just disposed of the Kerrang! title is another factor, the circulation of that mag has nosedived in recent years and the company might prefer to get on board with the older demographic that is still going to gigs, buying records and reading about the classic bands. Regardless, for a while at least there are three magazines covering this style of music and I intend to get a copy of Rock Candy mag in the near future in order to see for myself whether it lives up to its promises.